INTRODUCTION: The brain’s resting state activity accounts for about 80% of its energy consumption. Anaesthesia, in which consciousness is removed, involves a 40-50% reduction in energy consumption, implying that part of the resting state’s high level of energy consumption is used to sustain consciousness. The resting state also overlaps with the reward system which is based on midline structures, as distinct from lateral regions that are more involved in planning and reasoning. Some brain activity is spontaneous and independent of external inputs. This is intrinsic or resting state activity, originating inside the brain and independent of external stimuli. The concept of an active resting state has brought a change in neuroscience, with neural activity coming to be regarded as a blend of external stimuli and intrinsic activity. The brain has a high energy consumption, amounting to 20% of the body’s overall energy requirement. Of the 20% of the body’s energy consumption that is used by the brain, 80% of that, or in other words 16% of the body’s total consumption, is accounted for by the resting state. The previous emphasis on external stimuli rather than the resting state is argued to be an inheritance from behaviourism, that was subsequently perpetuated in 20th century cognitive neuroscience. The importance of the resting state has been emphasised by the discovery of the default mode network (DMN). This comprises various posterior and anterior cortical midline structures as well as the posterior parietal cortex. 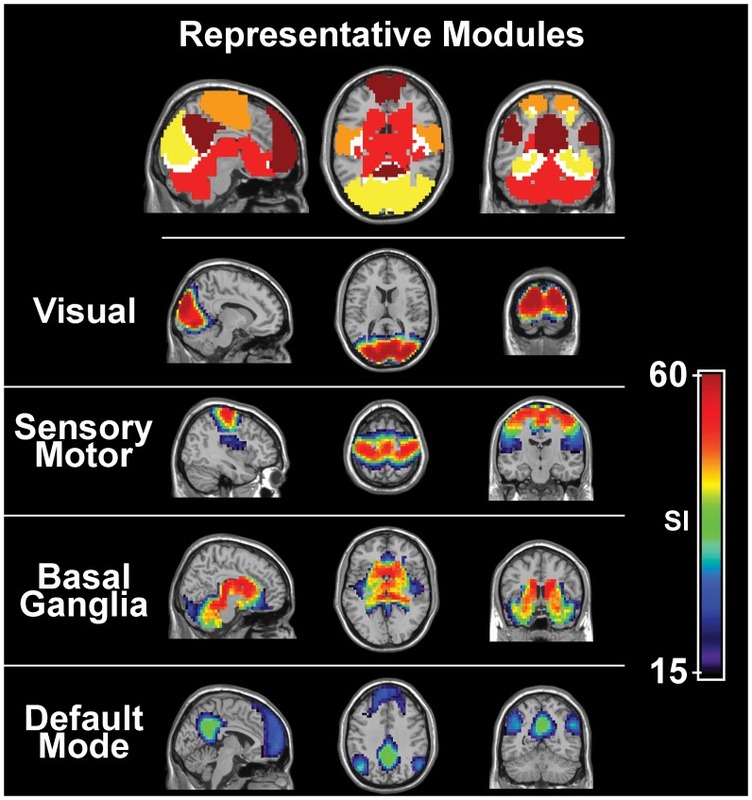 Activity was highest in the default network regions such as the cingulate, the precuneus, the insula, the medial prefrontal and the lateral parietal. The DMN is highly active in the resting state of the brain, and is associated with this rather than the processing of external stimuli. Other brain regions are active in the resting state, and this activity can extend to the sensory and prefrontal cortices and some subcortical areas. Studies of anaesthesia (R. Shulman), in which consciousness is removed, indicate a decrease in both energy consumption and resting state activity during anaesthesia, implying that energy consumption is important for the maintenance of consciousness. Northoff quotes studies showing reduced metabolism in anaesthesia; the greater the reduction in energy supply, the lower the level of consciousness. In deep anaesthesia a 40-50% energy reduction was widespread across the brain. This implies a reduction in intrinsic activity, which normally accounts for 80-85% of the brain’s energy consumption. The high energy demand of the brain looks to be primarily used to maintain the resting state activity, which in turn appears to be necessary for consciousness to be present. Consciousness is thus suggested to depend on the level of resting state activity. In anaesthesia, posterior midline regions such as the posterior cingulate, medial parietal cortex and the precuneus appear to be deactivated. Vegetative state: Similarly, vegetative patients show a 30-50% decrease in global metabolism. In vegetative patients, the low energy supply effects the brains intrinsic activity. Glutamate activity is related to energy metabolism, and thus to resting state activity and ultimately to consciousness. Vegetative state (VS) patients show a break down in functional and global connectivity especially in the midline regions. Neural synchrony also declines as between healthy subjects and VS patients, especially high-frequency oscillations such as gamma. VS deficits are particularly pronounced in the midline regions. Northoff views cognitive processes as being dependent on phenomenal processing, in contrast to the normal view that phenomenal experience somehow arises from cognitive processing. Attention, working memory and cognition are not here considered to be a cause or even a necessary pre-condition of consciousness. Phenomenal functions are seen as more basic than cognitive processing and to precede cognitive processes. This is because the state of the brain’s intrinsic activity is seen as impacting the subsequent processing of new signals. Phenomenal consciousness is suggested to be able to occur within the resting state without any external stimulus. Dreams and hallucinations are examples of this and these can include objects/events that have existed in the external environment. Resting state activity is high both in the awake state and the dreaming state or REM. A number of subcortical areas and the anterior cingulate are highly active in REM. By contrast, the dorsolateral prefrontal has reduced activity. The sensory and motor cortex appear to be actively suppressed during dreaming. Subjects (Pomarol-Clotet et al, 2006) took ketamine in a sub-anaesthetic dose and along with general inefficiency produced heightened and changed perception. The subjects’ perception of time was altered to the extent that it was stopped, but other subjects experienced a speeding-up of time. Spatial perception was also altered including out-of-body experiences. Temporal perception is abnormally extended or constricted. Space is also distorted. Ketamine blocks glutamate and this is claimed to account for the distortions. A recent study (Hong et al, 2010) suggests that ketamine changes the relationship between high and low-frequency fluctuations. Ketamine increases gamma fluctuation while reducing delta and to some extent theta. Withdrawal into an inner subjective world under the influence of ketamine was increased as a function of the increased ratio between rising gamma and falling delta. This is taken to support the idea that glutamate modulates the relationship between low and high-frequency fluctuations. The lengthening of the gap between the high and low frequency fluctuation is suggested to account for the lengthening of perceived time. Ketamine appears to distort the spatial structure within which the body is normally experienced, by changing the x, y and z coordinates of spatial continuity. Energy and neural activity involve a relationship to glucose oxidation indicating energy demand and a change in the concentration of glutamate. Higher firing rates increase the amount of glutamate which increases glucose oxidation. This suggests close coupling between energy consumption and neural activity, with glutamate and glutamine involved in this relationship. Most neuroenergetic couplings take place in the resting state. About 80-85% of glucose, the main source of energy, is used to maintain high neuronal activity in the resting state. The resting state is suggested to involve interactions between different brain regions and between high and low-frequency ranges. The intrinsic level of the brain is seen as preparing itself for external stimuli. This is referred to as predictive coding, which compares actual inputs to predicted inputs, with the difference being the prediction error. The amount of prediction error may determine the amount of subsequent stimulus-induced activity. Rather than thinking in terms of the external environment impacting the brain, intrinsic brain activity is suggested to influence the neural processing of external stimuli. 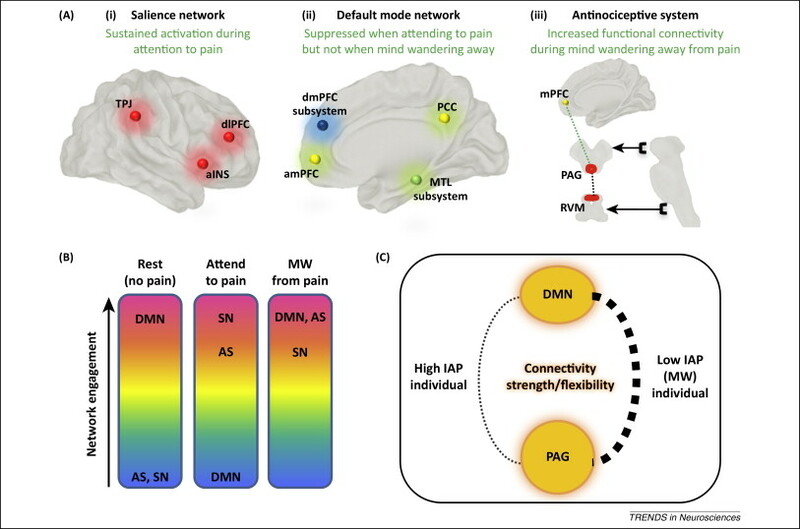 Functional connectivity involves interaction between different regions of the brain, notably in the resting state. Resting state activity is seen as the result of interaction between neurons in different resting state areas of the brain, and encoding of neuronal stimuli is seen as the basis for predicted inputs. The predicted input is suggested to derive from changes in resting state activity generated by interaction between different areas of resting state activity. Connectivity between separated regions of the brain is seen to involve low-frequency fluctuations. Spontaneous fluctuations of frequency are observed in the resting state and particularly in the DMN, but are also prevalent across the whole brain. Such frequencies are also found in the sensory cortex, the motor cortex, the insula, the basal ganglia and the thalamus. There are also high-frequency fluctuations in the brain’s resting state extending up from delta to gamma. The higher frequencies, including the K complexes seen in sleep, are shown to be phase-locked to the low frequencies. This is described as entrainment of higher by lower frequencies. The small temporal difference of the high frequency fluctuation is seen as fitting into the long temporal differences of the low frequency fluctuation. The structure of intrinsic activity is seen as being based on the differences between low and high frequency. Functional connectivity and low-frequency fluctuations are argued to characterise resting state or intrinsic activity. Resting state activity is viewed as already containing some information about the predicted input. The external stimulus has not yet occurred but is already processed on an ‘as if’ basis. The ‘as if’ function relates to the probability of a future event based on past statistics. Studies suggest that this processing involves anterior midline structures such as the ventromedial prefrontal and the anterior cingulate; these are regions of overlap between the resting state and the reward system. Activity in these regions is demonstrated to be predictive of activity during the period of reward. The organism is seen as having a built-in spontaneous predisposition to look for rewards and assign values; this may be needed to pick up potentially rewarding cues or stimuli in the first place. The brain’s intrinsic activity is seen as determining the kind of neural activity that external signals can generate. Northoff refers to work by Rao and Ballard in looking at predictive processing in the visual cortex. Feed-forward processing from the lower to the higher visual cortex was related to the difference between predicted and actual input while feedback involved predictions as to sensory inputs. An input the deviates from the normal involves the highest level of neural activity, while activity is low when signals are very predictable. The higher visual and prefrontal regions are suggested to provide a prediction of the possible input, and this is matched to the actual input. Activity in the frontal regions is seen as generating predictions, which in turn generates top-down modulation of the visual cortex. Thus the visual percept is a combination of sensory inputs and top-down predictions. Representation is seen as being sparse in the sense that single neurons or populations of neurons represent many stimuli. There is a many-to-one relationship between stimuli and neurons. The number of active neurons is lower than the number of stimuli. It is more economical to encode the distribution of the stimulus than everything about the stimulus. This sparse coding is suggested to be energetically efficient. This processing looks to require a certain level of energy present in neurons. It appears that in the vegetative state a major decrease in energy supply to the brain makes it impossible for neurons to achieve this sparse coding which therefore seems to be associated with consciousness. Some cells receive a massively convergent signal from many neurons that have received the initial signal. The cell that is converged on is seen as being very selective as to what it represents in relation to the large range of signals received. In the case of a region of the ventromedial prefrontal, there is evidence of a combination of weight of evidence from areas tuned to perceiving faces and tuned to perceiving houses. The many-to-one relationship can apply in terms of brain regions with signals from a number of other brain regions converging. Neural activity in the higher-order cognitive areas such as the dorsolateral and ventromedial prefrontal is seen as based on convergence from sensory regions. Activity in these areas cannot be explained in terms of inputs from single lower order regions, but deal with a convergence of more than one region on these areas. The condensation hypothesis refers to the concentration of neural activity from lower-order regions into a few and small number of higher-order regions. Condensation and sparsening of neural activity characterises higher order regions that predict subject’s behaviour. Reward describes the assignment of value to external stimuli. The reward system is driven by prediction errors. What is monitored is not so much the reward itself as its variation from predictions. The variation between expected input and actual input is seen as the reward or punishment rather than the actual positive or negative input. Reward activity and preferences are associated with particular brain regions such as the ventral striatum, the nucleus accumbens and the ventromedial prefrontal. The larger the prediction error, the stronger the neural activity in these regions. The interaction between bodily and external signals may be handled in subcortical areas and also in the insula and its connections to the anterior cingulate. The orbitofrontal-striatal circuit computes ongoing valuations across a wide range of stimuli. Prediction errors guide the system to learn the time and amount of future rewards, and may direct decision-making. It is suggested that the orbitofrontal computes a valuation of rewards and punishments and their predictors by providing a common valuation scale for diverse stimuli. This evaluates future events that have not yet happened and assigns attention and plans actions. Northoff looks at the relationship between reward and the resting state. The two overlap in the midline region including the ventromedial prefrontal and the perigenual anterior cingulate. Input predictions may depend on changes in resting state activity. The predicted input is generated during resting state or intrinsic activity. The ventromedial prefrontal and the ventral striatum, which are both involved in reward activity, also have high resting state activity. There has been shown a strong overlap between resting state and reward activity, notably in anterior midline regions such as the ventromedial prefrontal and the anterior cingulate. Overlap was also apparent in the posterior midline region. Predicted inputs are often associated with the ventromedial. The resting state appears to be closely involved in generating predicted inputs. Anticipation of reward produces changes in the ventral striatum and other basal ganglia also the precuneus, the cingulate and premotor cortex. The act of imagining the future, such as reward/punisher scenarios, produces strong activity in midline structures including the ventromedial prefrontal and the anterior cingulate. Several studies are claimed to demonstrate that resting state activity modulates stimulus induced activity. Studies show the level of resting state activity impacting the degree of perception. With the Rubin vase image, higher resting state activity in the fusiform face area was related to perception of a face rather than a vase. Again, the higher the pre-stimulus resting state activity in the dorsolateral prefrontal and the anterior cingulate, the faster were reaction times. The reverse relationship was seen in the sensory areas where the higher the resting state activity the slower the rate of processing. The level of activity in the default mode network also predicts the level of subsequent neural activity. Anterior midline regions like the perigenual anterior cingulate and the ventromedial prefrontal are particularly involved with the self. Resting state activity can predict the self-specifity of a stimulus. Self-related studies indicate strong activity in the anterior and posterior cortical midline such as the perigenual anterior cingulate and the supragenual anterior cingulate, the ventro and dorso-medial and the posterior cingulate. These regions are also involved in decision-making and empathy. Self-specifity is not confined to the midline structures as it also involves lateral parts of the prefrontal and the thalamus and ventral striatum. The cortical midline structures are core regions of the default network that show a higher rate of neural activity in the resting state. The midline structure are implicated with the self and neural activity related to the self may overlap with the high activity of the resting state. The ventromedial prefrontal has been associated with higher activity to do with the self, also activity was found in the medial fronto-parietal and the posterior medial network. Studies have confirmed the strong overlap between the resting state and regions involved with the self. Recruitment of stronger neural activity was particularly seen in the posterior and anterior midline regions such as the ventro and dorso-medial and the anterior and posterior cingulate. Increased gamma power is also suggested to be involved in self-related activity. Emotion, reward and decision-making are seen as impacted by the self and the midline region. Cognitive functions such as working memory and attention are more associated with the lateral regions in the parietal and prefrontal, which are less involved with the self. However, this does not exclude such regions from the self because these regions are also influenced by the midline structures. Strong loads in the cognitive areas impact the midline areas in the form of deactivation, and are thus considered to modulate resting state activity. In a study of emotional reaction to pictures, there was a significant relationship with neural activity in some subcortical areas such as the ventral striatum, and some cortical areas such as the anterior cingulate, the ventromedial and the posterior cingulate. The higher the neural activity in these regions, the more subjects related the pictures to the self. In a study of decision making externally guided decisions produced stronger activity in lateral frontal and parietal regions, while internally guided decisions produced stronger activity in midline regions such as anterior and posterior cingulate and ventro and dorso medial, supporting a distinction between internally and externally guided decisions and the relationship of self to the midline structures. Further, the N200 wave which is associated with decision making had activity correlated to resting state activity of delta, theta and alpha frequencies for internally guided but not externally guided decisions. This physical distinction between internally and externally guided decision, with internally guided decisions involving areas that correlate with conscious perception of subjective preference is suggestive of the physical participation of conscious will in internal decision-making.